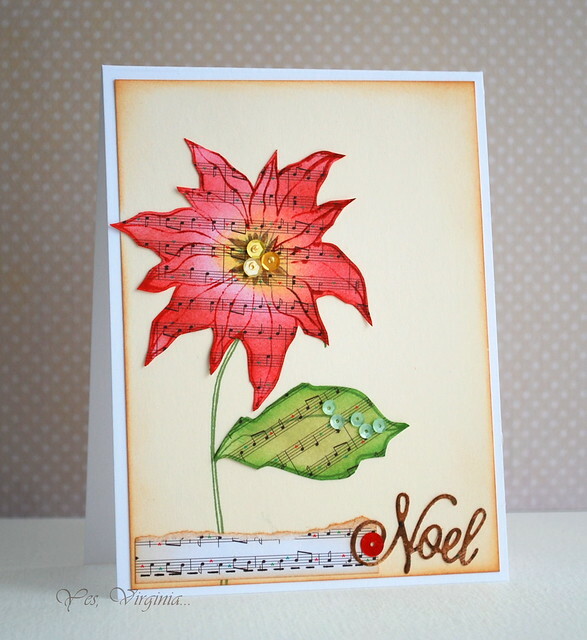 I am excited to share a new project with you today (LAST day of 2014!). You see, CAS-ual Fridays Stamps is having a sneak peek for some new releases that are coming your way. First up, it's this set called "Mwah"! 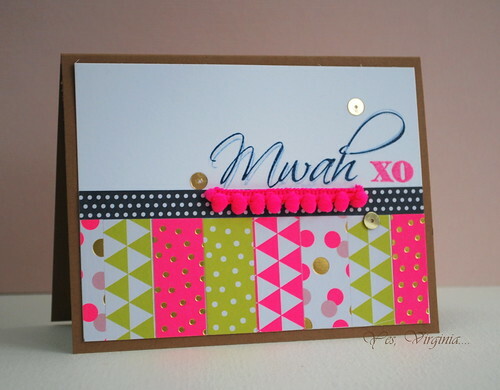 I find the sentiment really CUTE and decided to pair it up with bright neon pattern paper. I even added a strip of pom pom ribbons! What do you think? This set comes with really gorgeous handwriting and I can totally see me using them over and over again. 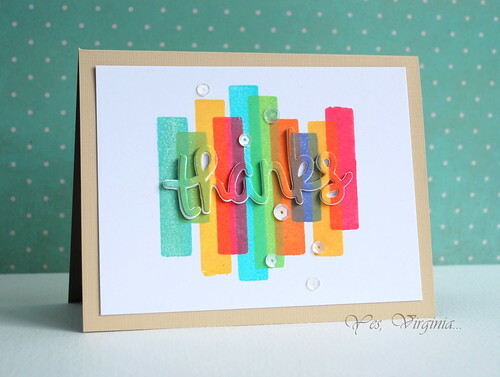 Please stop by CAS-ual Fridays Stamps for more inspiration from my DT mates! 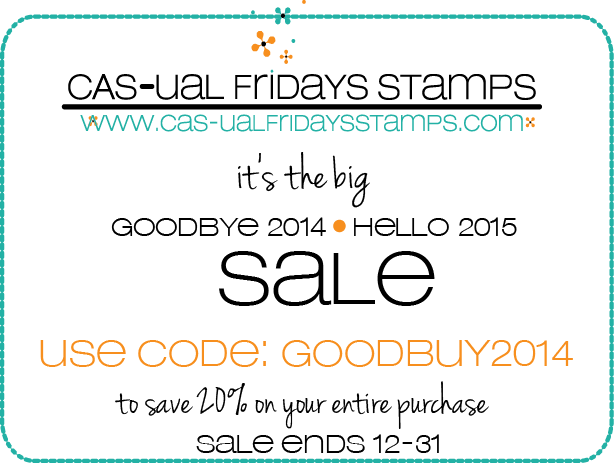 Be sure to leave a comment for a chance to win yourself a new set of CAS-ual Fridays Stamps! 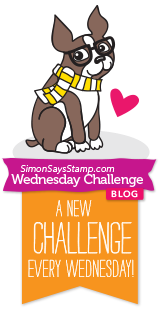 Lastly, over StampNation we have another challenge (last one for 2014!). Here is a sneak peek. I will have more exciting events about StampNation coming up in January. 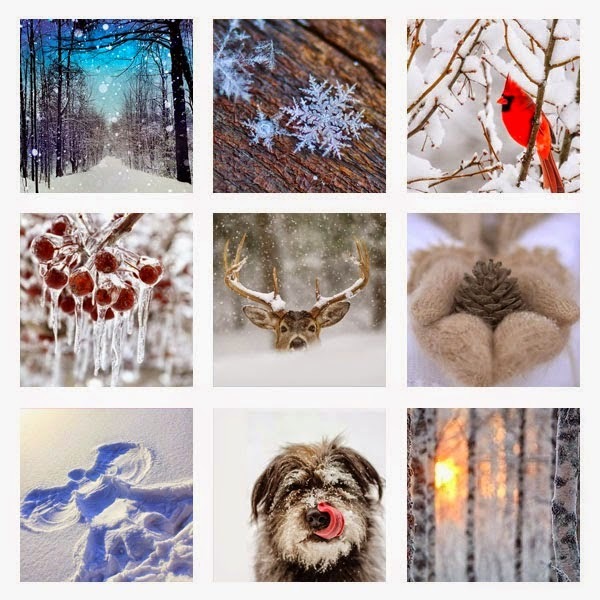 I thought it would be fun to share my absolute favorite cards that I created in 2014. If you would like more details about the card itself, simply click on the photo. It will take you to my Flickr photo and you can find the blog link and pertinent information. Looking back, I am amazed at the sheer numbers of cards I made. Are you ready? 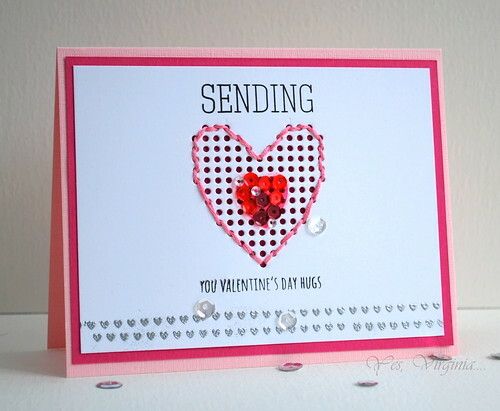 It's a Valentine's card for you today! This card was really fun to make. I had fun doing the stitching. You really can't go wrong with the heart shape.You can use it all year round. In case you are wondering...the sequins inside the stitched heart were glued on one by one (no stitching involved here). 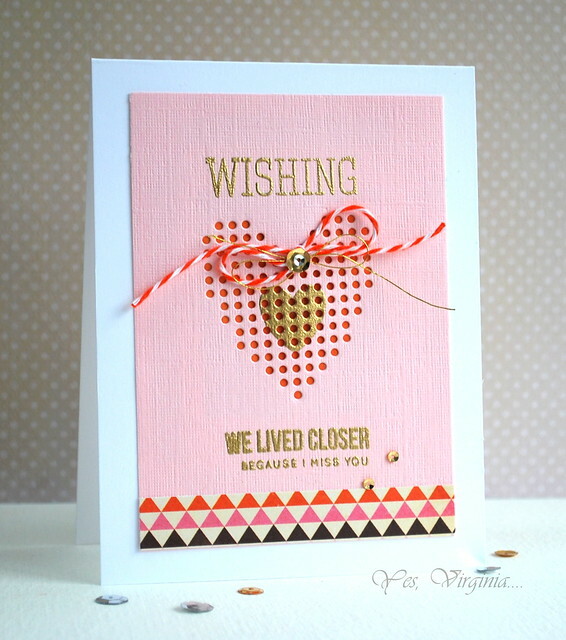 I stamped a small pink heart and use it as a guide to glue the sequins with Multi Medium. Love the look! 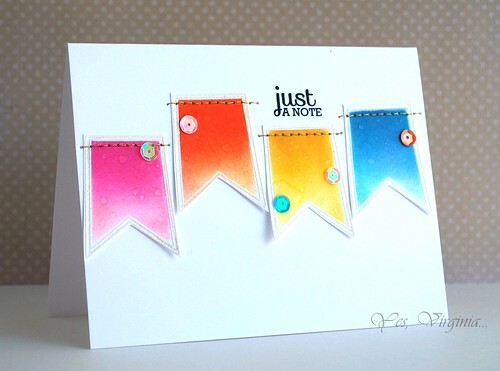 I am loving the Screen Elements dies from Simon Says Stamp and hope to come up with more ideas with these dies! My family and I just came back from visiting my in-laws and that was where I picked up my World Card-Making Day prize. It sure is perfect timing as it was Christmas! Can you imagine my excitement when opening this huge box of goodies? ....I am still amazed. There will be more giveaways in 2015, I promise!! Hello! Hope you have a super fabulous Christmas! I took few days off from blogging and card-making. I thought it might be a good idea to share some cooking instead. Today's post is about a simple snack in Chinese cuisine. 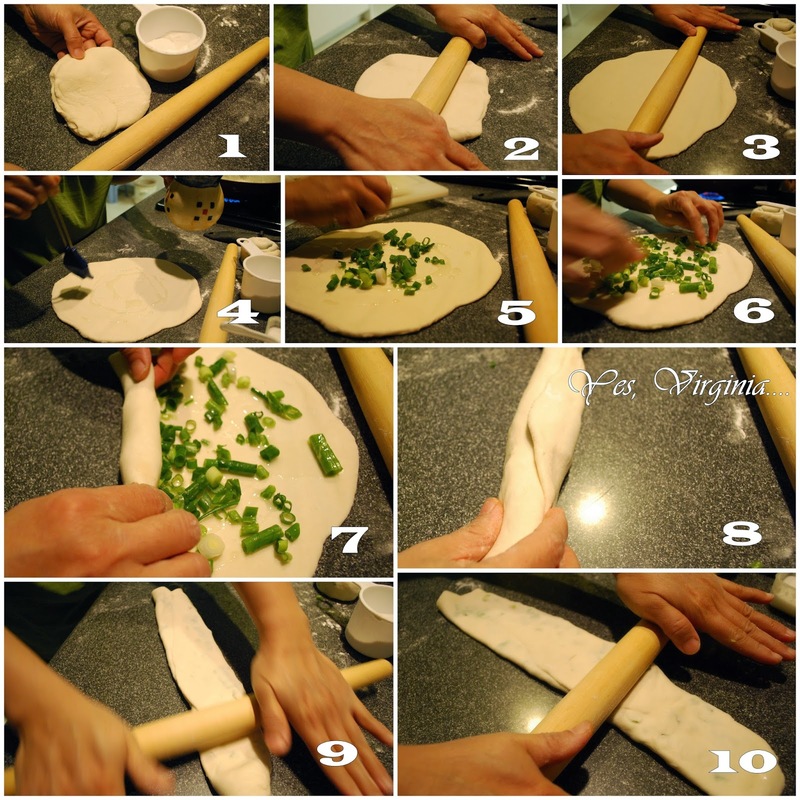 Scallion Pancake/葱油饼 are available in mainland China, Taiwan and other areas of the world with ethnic Chinese populations. You can find them in restaurants and as a street food item, You can buy them frozen in Asian grocery store. 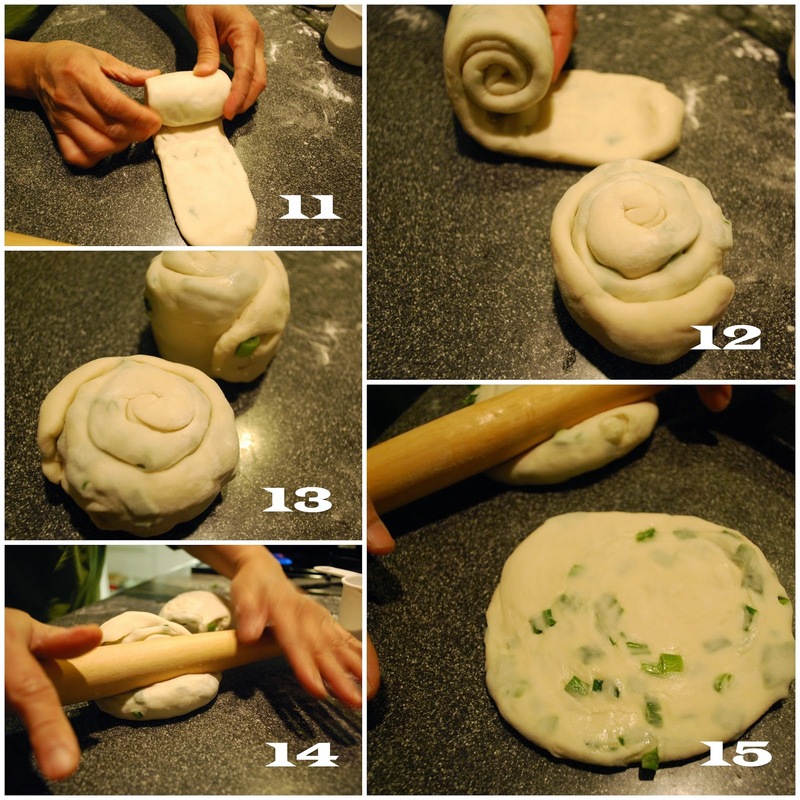 I often make my own dumpling dough, so it is not a huge stretch to make the Scallion Pancake dough. My daughter Stephanie helped me with the photo-taking, so it is easier to see how they were made. 1. after kneading the dough, let it rest for 20 minutes. Some people like to add eggs to the pancakes. So I did just that. Don't they look delicious? How is that for a snack? 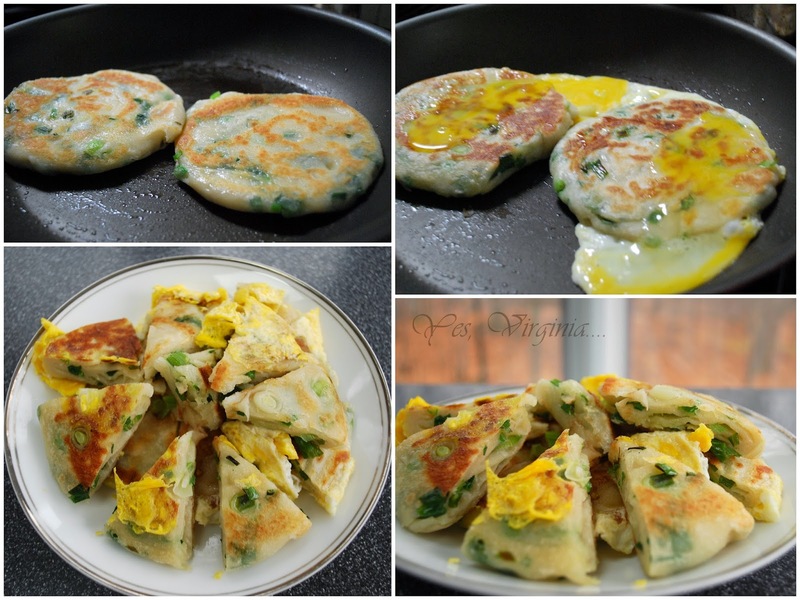 Hope you have an idea what Scallion Pancakes are like. Perhaps you want to give this a try? Yup, this is how I roll. 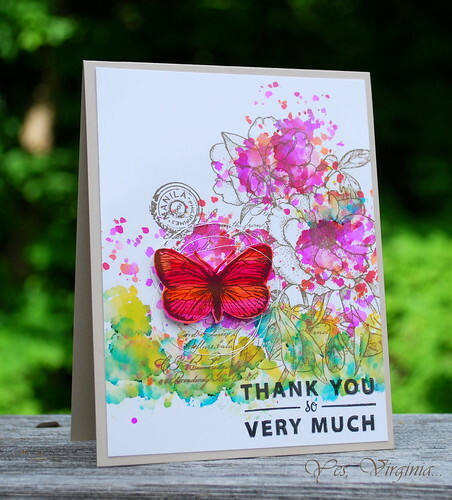 For inking of this stamp, I used Radiant Neon Inks from Imagine Crafts. The colors are gorgeous and vibrant. After that, I did a layer of clear-embossing to prevent the colors from smearing. The sentiment is from a Fancy Pants Sticker. I added some silver strings and sequins to complete the design. I hope you check out the DT's work! I can't wait to see what you create! Also, this is a TWO-WEEK challenge, so you can take your time to create during the holiday season. Lastly, I want to wish you a VERY MERRY CHRISTMAS! Hello! As Christmas is getting closer...are you getting ready? 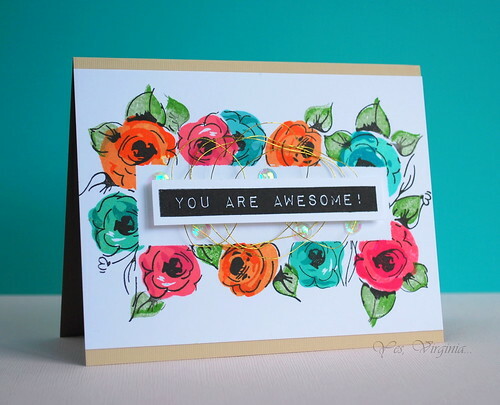 I am sharing a simple card with you today. 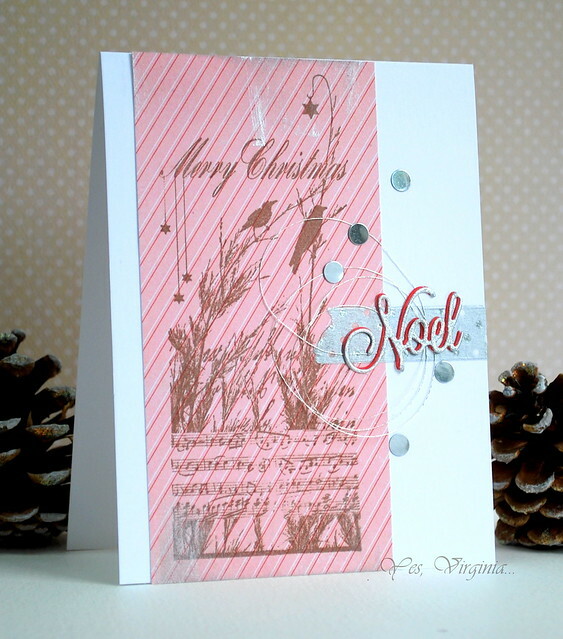 This card may not look simple, that is because I stamped on the pattern paper and added a touch of silver. The image "Nature's Choir" is from Penny Black. The silver diecut sentiment, silver confetti, inked edges (with Delicata silver), silver strings and silver Washi tape! The Penny Black stamp image really does all the "talking"! 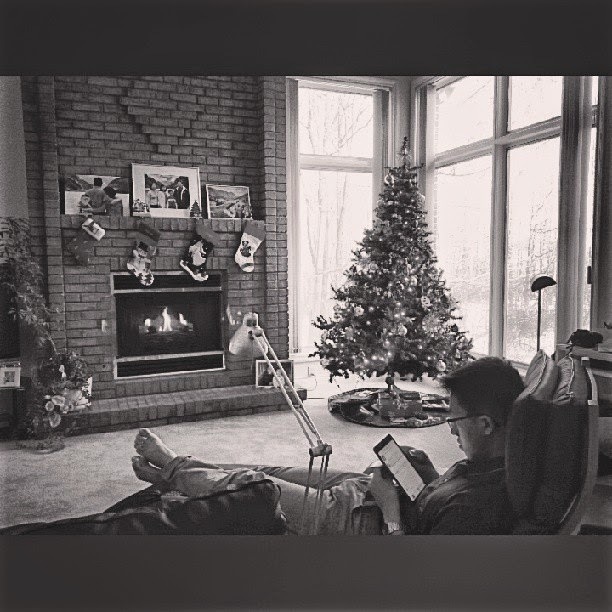 I hope that you are enjoying the Christmas season. I will be stamping less and spending more time with friends and family. My desserts display from last Friday's party. Looks like we are ready for Christmas. 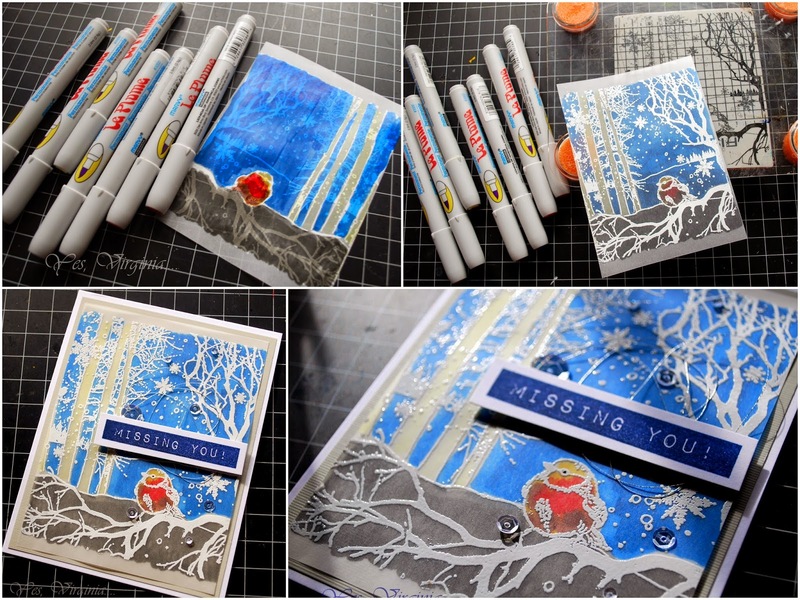 As you may know, 2014 proved (to me) to be the year of watercoloring in the card-making world. 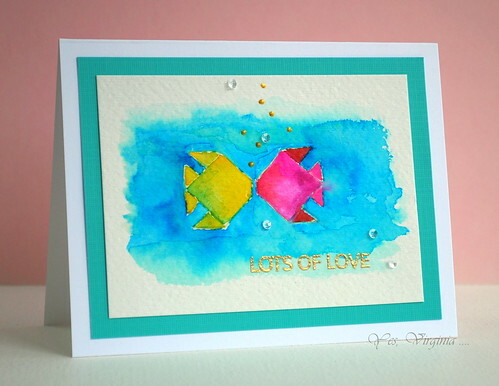 I am sharing a card I made for this year's World Card-Making Day contest for the Love category. It was not picked as a winner; my thank-you card got selected instead. I still love this card so much and thought it would be great to share with you. Are you loving water-coloring as much I I do? Have you tried no-line water-coloring yet? Hello! Are you doing the last minute Christmas rush? I think I survived the Christmas party we hosted last night...We had two large tables and a huge Chinese dumpling-making station set up for the party of 15. It was noisy, fun and festive! Here is shot of our family room BEFORE the party. My son David was chillaxing.. I am popping in with a quick post about a card that I made a while ago. I simply used assorted Christmas sentiments and arranged them in a pleasing manner. 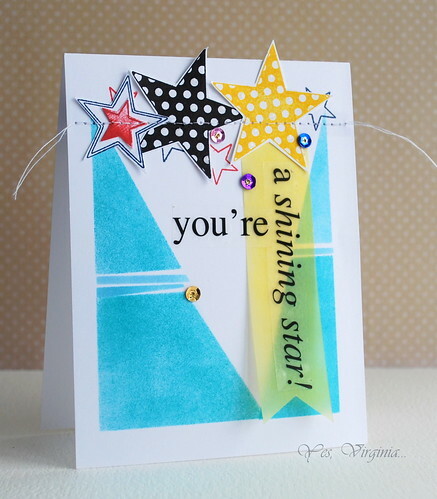 For the small gaps in between the sentiments, I stamped some stars to complete the design. Then I white-embossed all of the sentiments. After that, I applied Gelatos with a bit of water. And that's IT! This was one of the 30 cards that I donated to our church. It was all because I had made a richly watercolored paper background. I though it was too good to waste, so I created a card with some intricate dies. Yeah, it's nice to do something with that colored paper as a canvas. I used CAS-ual Fri-Die (Flurry) to make some die cuts. 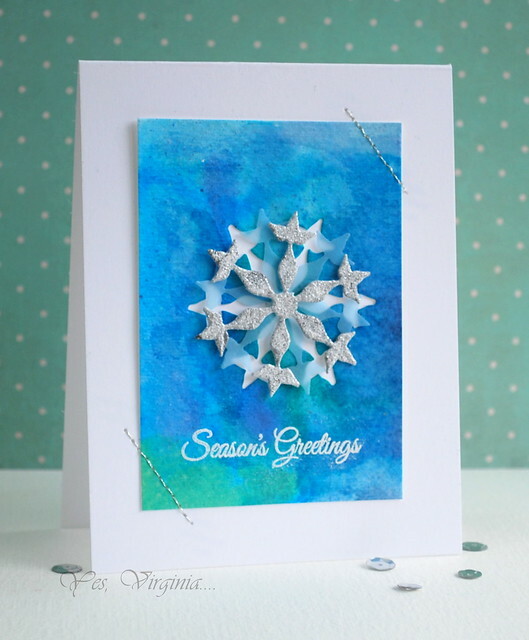 First, I made a cut through the watercolor paper, then added blue vellum and the twice silver-embossed snowflake on top. I added some silver stitching at the corners to keep the design balanced and interesting. I am slowing mailing out my Christmas cards. It's definitely a good thing that I donated 30 cards to our church. I vow to do better each year (sigh). My big kids just set up the Christmas tree last night...I know it's a little late, but it's better late than never, right? Lastly, here is a sneak peek of the current challenge over StampNation. We are having Stephanie's church group of 15 over for dinner tomorrow. I am off to prep and bake! 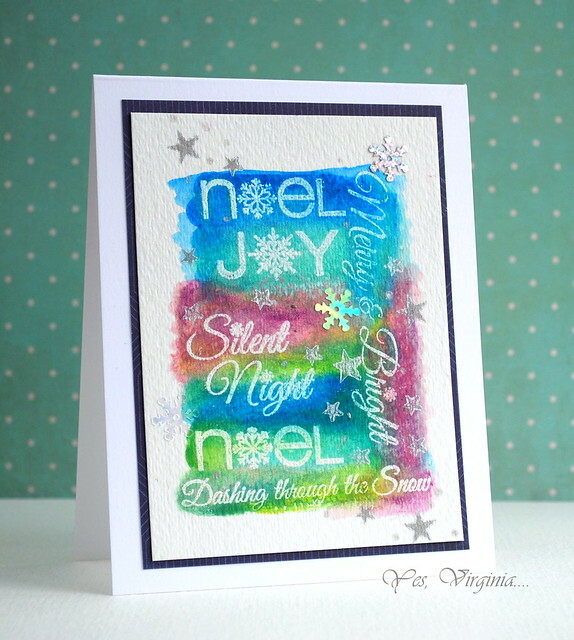 As you may know, I have created many cards with this stamp set. You can see 3 other versions here. 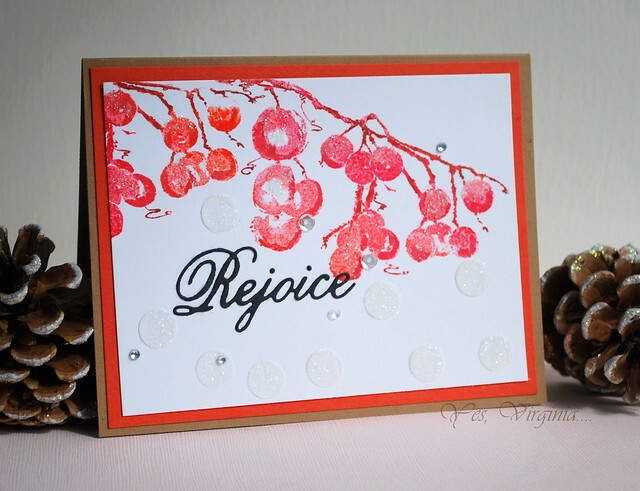 This time I used stenciled dots to mimic the snow. 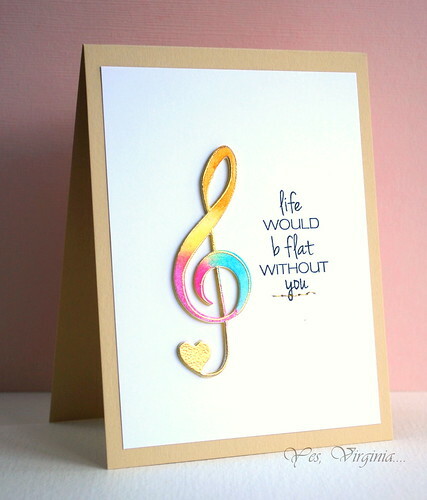 Just popping in to share a card. You may have already seen it over Virginia's View Challenge . 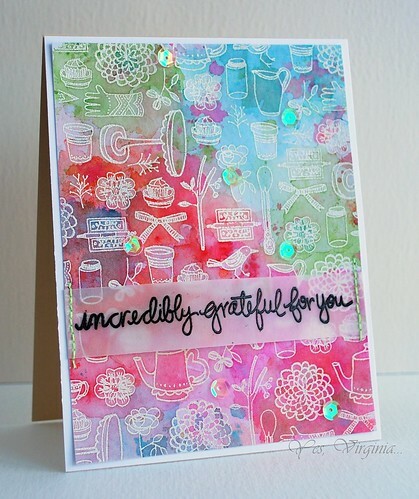 You see, with distress inks, you can color the entire image with your sponging/distressing. 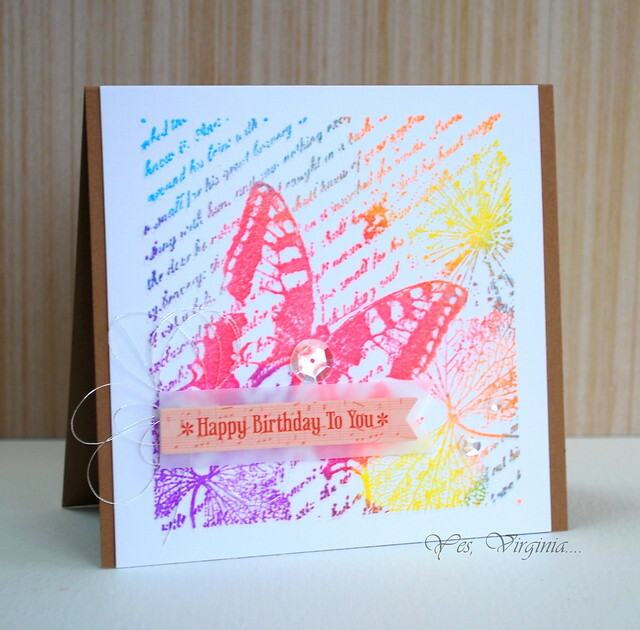 This stamp Sparkler is ideal for this type of distressing. I also did it on pattern paper for added interest. Lastly, here is a cute photo of my daughter Stephanie from yesterday. Stephanie successfully passed her comprehensive exam for her PhD. 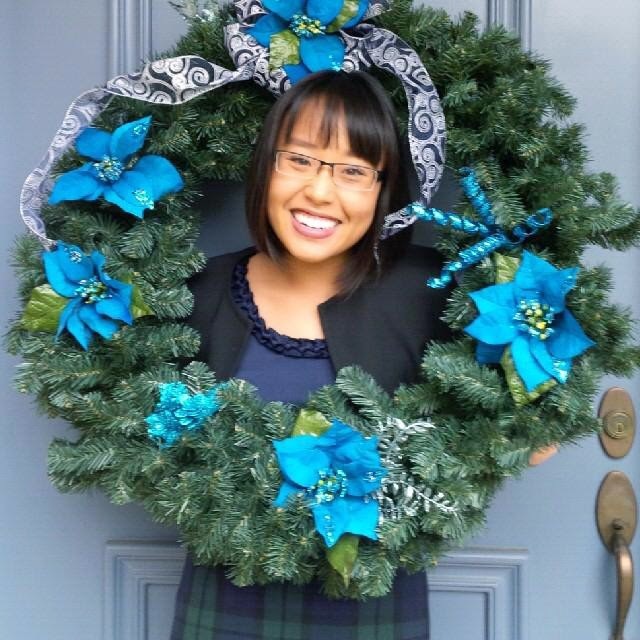 She is now officially a PhD CANDIDATE (instead of a PhD student) in the School of Public Health and Health Systems at the University of Waterloo--BIG difference, huh? LOL. "....While Stephanie’s Master’s thesis explored individual meanings of health and illness in the realm of food allergies, she has since shifted her focus to program evaluation and global health. For her dissertation she is evaluating NGOs who work in the water, sanitation, and hygiene (WaSH) sector using gender-responsive and utilization-focused approaches. Outside of her research work, Stephanie is a Co-Director for Stand Up to Stigma—a student-led mental health initiative at the University of Waterloo. In her spare time she also enjoys playing the cello and working as a wedding photographer." As you can tell, I am so proud of my girl. Way to go, Stephanie! Hello! It's always fun to share new things/techniques with you. Today's card is a follow-up on a previous card that I made (see here). I am showing you the simple process of how I created this card. You can use any markers (such as copics, Sharpie,...) to color the backside of the vellum. As long as you have a plan before you color, you are good to go! I hope that you like this technique! 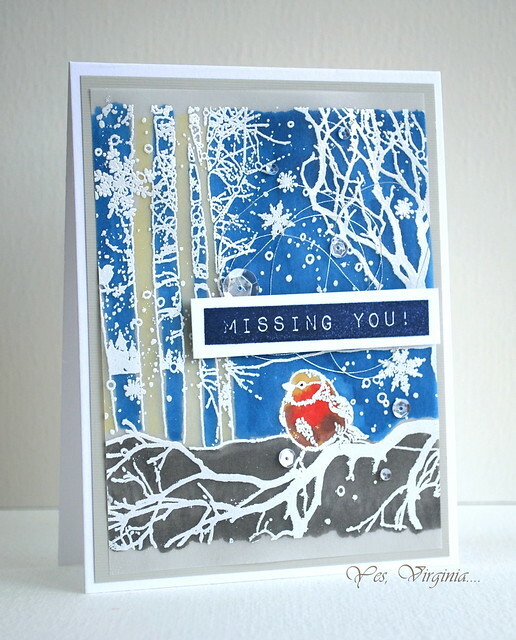 And don't feel intimidated with a detailed stamp like "Winter Song". It really is easier than you think. 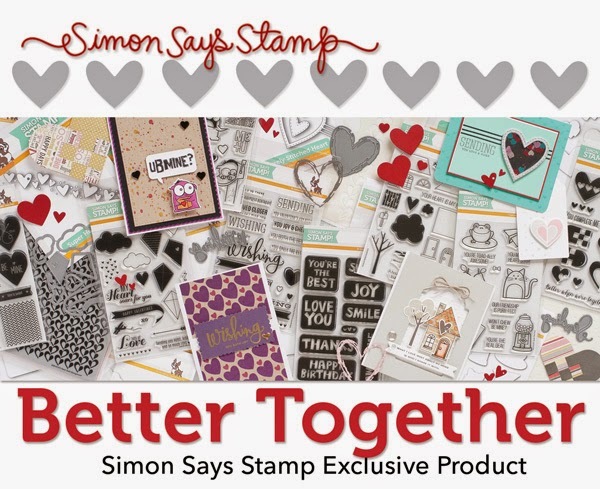 Simon Says Stamp is having another new release (details here). 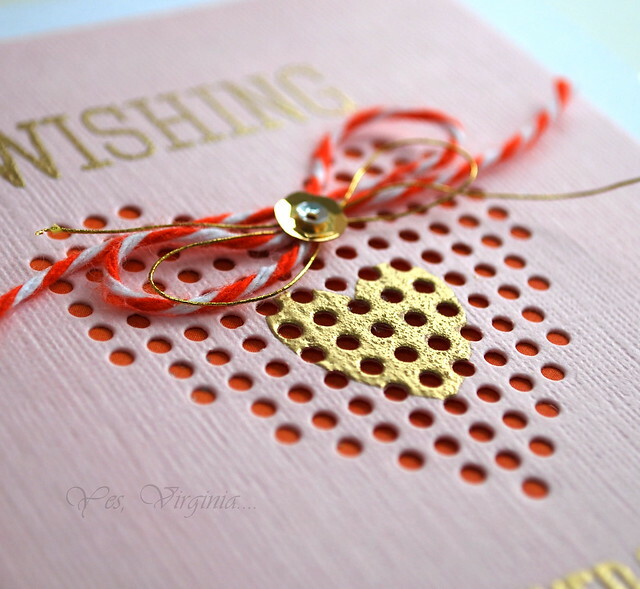 In case you are tired of making Christmas cards, this collection "Better Together" will get you started on card-making for Valentine's Day and all the special greetings that you send year round. Lucky for me to get one of the new stamp sets called Sending and Wishing. 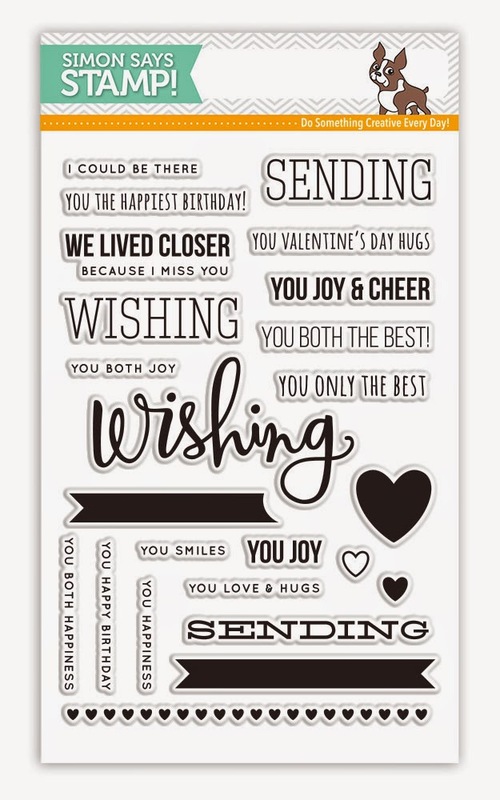 This set comes with many sentiments that you can use for numerous occasions: weddings, anniversaries, Valentines, birthdays, encouragement, thinking of you....etc! 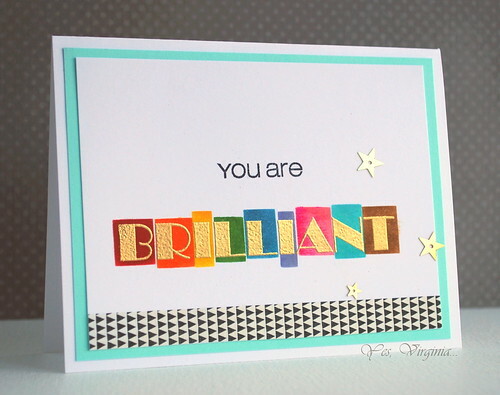 If you are looking for a versatile sentiment set, you definitely need to consider this one. was CALLING my name... what can I say? It was love at first sight! This set gives me the satisfaction of doing some easy stitching. 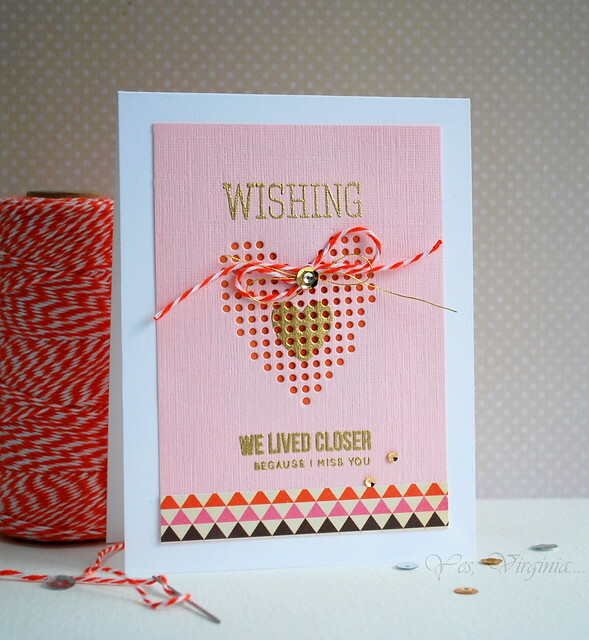 Today's card is the result of these two fabulous goodies! 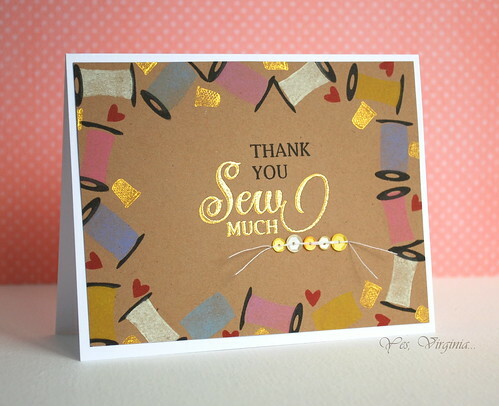 With embossing, bits of pattern paper ( Basic Grey's Vivienne), twines, gold strings and sequins, this card is done! Many of my friends and family do not live close to me. This is the first time that a sentiment said: "Wishing we lived closer, because I miss you". Perfect. Today is a SPECIAL day ... for me! Playing with Gelatos and Dies! 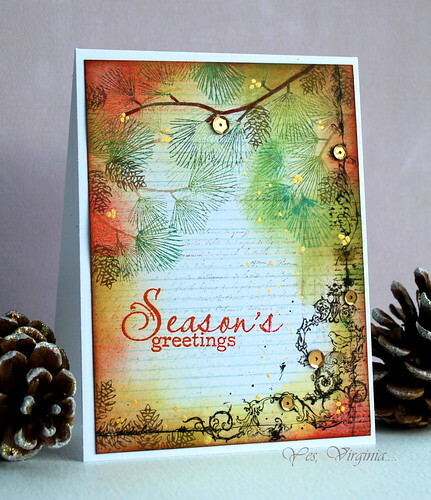 CAS-ual Fridays Stamps--Cyber Monday Sale!